The Kidneys in the Bible: What Happened? The kidneys, always used in the plural (kelayot), are mentioned more than 30 times in the Bible. In the Pentateuch, the kidneys are cited 11 times in the detailed instructions given for the sacrificial offering of animals at the altar. Whereas those instructions were for purification ceremonies at the Temple, sacrificial offerings were made subsequently in seeking divine intervention for the relief of medical problems. In the books of the Bible that follow the Pentateuch, mostly in Jeremiah and Psalms, the human kidneys are cited figuratively as the site of temperament, emotions, prudence, vigor, and wisdom. In five instances, they are mentioned as the organs examined by God to judge an individual. They are cited either before or after but always in conjunction with the heart as mirrors of the psyche of the person examined. There is also reference to the kidneys as the site of divine punishment for misdemeanors, committed or perceived, particularly in the book of Job, whose suffering and ailments are legendary. In the first vernacular versions of the Bible in English, the translators elected to use the term “reins” instead of kidneys in differentiating the metaphoric uses of human kidneys from that of their mention as anatomic organs of sacrificial animals burned at the altar. This initial effort at linguistic purity or gentility has progressed further in recent versions of the Bible, in which the reins are now replaced by the soul or the mind. The erosion may have begun in the centuries that followed the writing of the Bible, when recognition of the kidneys as excretory organs deprived them of the ancient aura of mysterious organs hidden deep in the body but accessible to the look of God. At approximately the same time, Greek analytical philosophy argued that the brain, which is never mentioned in the Bible, was the most divine and sacred part of the body. This argument gained ground in the past century, when the functions of the brain were elucidated, and ultimately established in the 1960s, when salvaging the kidneys for transplantation necessitated a change in the definition of death as irreversible brain function. It is ironic that advances in understanding kidney function and in nephrology that made kidney transplantation feasible may have contributed, albeit indirectly, to the gradual elimination of the metaphoric mention of human kidneys in the Bible. The mythical and metaphorical uses of the kidney in literature and the arts in general remain a relatively unexplored subject (1,2). Information on its use in ancient times is even dimmer. There is not a single reference to the kidney in Frazer’s (1854 to 1941) seminal anthropologic work, The Golden Bough (3). By contrast, the figurative use of the kidney in the Bible has been the subject of several articles and is dealt with, albeit briefly, in most general texts on medicine in the Bible, which are quoted in the references that follow. They have been extremely useful in the preparation of this article, which is an attempt to interpret references to the kidney in the Bible within the historical context and prevailing social, medical, and religious customs of the times. The guiding principle in doing so has been the rabbinic saying, “There are seventy faces to the Torah” (Num. Rab 13:15), meaning that biblical texts are open to 70 different interpretations and this is just one of them, but only as it pertains to the kidney. It is not meant in any way to undermine the sacredness of the quoted scriptures but to add depth to their meaning by considering them in the context of the historical period in which they were incorporated into the inspired writings. Neither is it an attempt to trespass into the domain of learned interpreters of the Bible, be they scholars of religion or history, but rather an effort to incorporate the historical evolution of our understanding of the kidney and advances in nephrology in the clarification of the use of the kidney in the Bible. Throughout the text, the term “Bible” is used to refer to the Hebrew Bible or the Christian Old Testament. Where applicable, the term “New Testament” is used to refer to the added sections of the Christian Bible, and the term “Torah” is used to refer to the Pentateuch, or first five books of the Bible. All scriptural verses quoted in the text are from the King James Version of the Bible. A brief overview of biblical history is helpful in understanding its use of the kidney, which henceforth is used in the plural as it appears throughout the Bible (kelayot, pl. ; kolya, sing.). Its use in the plural has been interpreted to mean that the ancients knew that there were two kidneys. They most certainly did. However, their use in the plural also implies the kidneys in general, as reference to the heart is also made in the plural on occasion (Psalms 7:8) but not invariably so as it is for the kidneys. In doing so, the biblical authors were following the dialects of the ancient Semitic languages, of which Hebrew is one, spoken in the Middle East. The Akkadian use of the kidneys in the plural (kalāte) appears in cuneiform texts from 1700 before Common Era (BCE) or even earlier (1,4). Of interest is the explanation given for the presence of two kidneys in the Talmudic corpus, which reasons that there are in humans two kidneys, one to give good and the other bad advice (5). The Bible is a complex and exquisite work of literature because of the wondrous way in which it was created. Unfortunately, this also presents difficulties in its historical interpretation. Originally assembled from sources (oral to begin with and then written as the alphabet was developed) composed in three languages (mostly old Hebrew, some in Aramaic, and few in Greek), it was written over a span of approximately 1000 years (ca. 1300 to 400 BCE), during which the original texts were written and rewritten, copied and recopied, edited and reedited, and then collated and redacted. The process of canonization was a long one, which was not completed until the end of the first or early second century Common Era (CE). Written not as a chronicle but as a testimony of faith, the Bible is difficult to stratify and treat chronologically. Several events are recounted and appear in differing versions and at variable time periods. Verification is complicated by linguistic difficulties, presented by the use of language written in consonants and without punctuation during several distinct periods, compounded by the loss or survival of only fragments of the original sources, because of the inherent fragility of the parchment and papyrus on which they were written (6–9). Nevertheless, in some ways, the Bible does hold in its pages reflections of real events, garbled perhaps by time and recounting, but nevertheless of stories that occurred in real time. As such, the process of comparing biblical history with mainstream ancient history in general and of medical history in particular can be valuable, especially when it is done in the broader context of evolving trends and regional customs, rather than specific dates and precise locations (8–10). Considered in this broader context, the narrative of the Bible begins toward the end of the Bronze Age and the start of the Iron Age (Figure 1). This was a tempestuous era of human migrations, invasions, and devastations, during which emerging city-states were continuously warring and beginning to give way to organized empires. As a result, the burden of human disease was changing from the stage of pestilence and famine of prehistory to that of the receding pandemics brought about by fixed settlements and close living in the evolving river civilizations of the Middle East (11). It is on this stage that the primal figure of Abraham journeyed from Ur to Haran and by way of Canaan into Egypt. In doing so, he was traveling the trade routes of the ancient Middle East that extended from Mesopotamia through Syria and Canaan into Egypt. Although Abraham’s sojourn in Egypt was brief, the Patriarchal figures who followed him escaped the famine, pestilence, and warring tribes of Canaan and wisely elected to settle in the relatively richer, healthier, and more stable environment of pharaonic Egypt, where they dwelt for centuries (8,12,13). As such, by the time Moses led the Hebrews out of Egypt, they took with them many of the customs and concepts that they had acquired and assimilated during their stay in Egypt, including those pertaining to hygiene and medicine. Even after they settled back in Canaan, emerged as a nation, started to interact with their neighbors to the east and north, and began composing some of the older original biblical texts, they remained within the sphere of influence of Egypt for several centuries longer, before coming under that of the Babylonian and Persian empires in the seventh century BCE and thereafter, when the final version of the Bible began to be edited (7). By the time it was canonized, Alexander had conquered the Middle East, and Hellenistic science and philosophy were beginning to exert their influence on the thoughts and customs of the region (Figure 1). Time course showing the principal periods, regions, events, and personalities during biblical times. The Hebrews, unlike their neighbors, the Egyptians and Babylonians, left no medical literature, although the Bible contains many references pertaining to medical subjects that consist mostly of laws governing personal and social hygiene, limited reference to external, possibly infectious, diseases (e.g., skin, eye, genital discharge, intestinal diarrhea) and some mention of various body organs (13–18). By the time the Torah was composed, medicine had developed to a reasonable degree of sophistication (Figure 1). Beginning in the mystical origins of primitive medicine’s magical recipes, empirical observations had led to the accrual of a body of knowledge on the relative safety and curative properties of a disparate group of natural products for the relief of the signs and symptoms of illness. Over time, several of these were integrated into folk medicine, whereas others were consolidated into the materia medica of medicine as it evolved gradually from the priestly medicine of prehistory into the ancient world’s early professional physicians, whose therapy remained directed at signs and symptoms to relieve pain and suffering. The cause of illness was attributed to supernatural forces. Possession by demons and malevolent spirits was considered the why and wherefore of disease, especially in Mesopotamia but also in the relatively more sophisticated medicine of Egypt (12,19). Attributed to the pantheon of deities and demons that ruled their vision of the world, illness was perceived as a punitive instrument for transgressions against or breached promises to one of the divinities (10,19–21). As such, in both regions, medicine initially developed as ancillary to religion. Only in later periods did a special group of healers who were not members of priesthood arise (22). Even then, sickness continued to be attributed to hostile spirits or the anger of a deity, so medications, no matter how powerful or effective, were expected only to alleviate symptoms. It was the incantations, spells, and prayers recited conjointly that could remove the cause of the disease and cure it (4,12,14,20). Minor ailments were accepted as part of the normal pattern of life. Most illnesses were suffered in silence and treated at home with folk medicines by members of the extended family. Only when a disease was severe or prolonged was health care sought from its priestly providers, usually in temples (18–21). It was just about this transitional period from priestly to professional medicine that the Torah was written. It was this general concept of illness and its cure that was to formulate the concept of disease in the Torah and to affect it in the books that followed: “I am the Lord your physician” (Exod. 15:26); “I kill and make alive. I wound and I heal.” (Deut. 32:39) unequivocally declare the jealous Yahweh of the Torah. This divine monopoly on healing left no room in the Bible for the magical charms and incantations of the healers of Mesopotamia and Egypt, which accounts for its hostile view of physicians, who are sanctioned and enjoined throughout most of the Bible (23–25). Thus, the kings of Judah, Asa (ca. 913 to 873 BCE) and Hezekiah (ca 715 to 687 BCE), are faulted and reprimanded for seeking medical care from physicians for their respective diseases (2 Chron. 16:12; 2 Kings 20), whereas Job, whose afflictions could not be cured by medical men, characterizes them as “ physicians of no value” (Job 13:4). According to the Mishnah, “the best of physicians are destined to go to hell” (Kidushin 4:14). Conversely, Jeremiah (ca. 626 to 582 BCE) was surprised that Gilead (a mountainous region in Transjordan) had no physicians or balm left to treat the children of Israel (Jer. 8:22), whereas Josephus (ca. 37 to 100 CE) attributed to Solomon (968 to 928 BCE) a considerable knowledge of medicine (26). Legend has it that Hebrew medicine began with Solomon, who is said to have compiled a book of remedies that was subsequently found and concealed by Hezekiah (23,24). Actually, this may not be a far-fetched likelihood, because “Solomon’s wisdom excelled the wisdom of all of the children of the east country, and all of the wisdom of Egypt” (1 Kings 4:29). Surely that wisdom contained some medical lore, and if it did, then so also must have that of Moses, who “was learned in all of the wisdom of the Egyptians” (Acts 7:22). He was certainly familiar with the art of apothecaries (Exod. 30:35). Moreover, it was Moses who at God’s command crafted a bronze serpent erected on a pole to relieve the effects of a plague of poisonous serpents (Num. 21:8 to 9). This or a copy of it later was placed in the Jerusalem temple, where it seems to have been used to heal disease, until Hezekiah destroyed it because of its implications of idolatry (2 Kings 18:4). This use of serpents for therapeutic purposes reflects similar patterns of temple healings in Canaan that survived well into the period of Greek rational medicine (25–27). By the time the Bible was completed and canonized, Greek rational medicine had fully emerged and in the footsteps of Alexander’s conquests was permeating Middle Eastern medical thought (Figure 1). In fact, Alexandria, where Greek rational medicine flourished under the first Ptolemies, was a Jewish center of rabbinical studies with close ties and considerable influence on Jerusalem and the court of Judah (28). One impact of these changes was that seeking treatment from physicians gradually became acceptable, and in one of the Apocryphal Books of the Latter Prophets, seeking the help of a physician is justified but then only as one who is God’s agent of healing for “the Lord hath created him” (Eccl. 38: 1 to 15). As much as biblical medicine betrays to a great extent Egyptian and to some extent Mesopotamian influences, it differs from them in two ways. First is the inclusion in its chronicles of the pestilence and famine of prehistory and the receding pandemics of the city-states and empires. Their mention is rare in the medical writings of Egypt and Babylonia (14). By sharp contrast, they are given center stage in the stories of the Bible, beginning with the famine that drove the Patriarchs to Egypt, followed by the calamities that God wrought on the Egyptians to let his children return to Canaan and the concluding promise that, if the settlers would hearken to the voice of the Lord and follow His statutes and commandments, “I will put none of the diseases upon them, which I have put upon the Egyptians, for I am the Lord that healeth thee” (Exod. 15:26). The other difference is that of reference to the kidneys approximately 30 times in the Bible (2,29,30), whereas their mention in Egyptian medical texts is questioned (31) and in Babylonian ones superficial (32,33). By far the most common mention of the kidneys in the Bible (11 times) is about the parts of sacrificial animals that are to be burned in Temple offerings. The authorship of these methodical instructions is attributed to P, whose central concern is Priesthood. It is the latest of the sources of the Torah and is considered to have been composed between the sixth and fifth centuries BCE (6,7). The formulaic verse “And thou shalt take all of the fat that covereth the inwards, and the caul that is about the liver, and the two kidneys, and the fat that is upon them, and burn them above the altar” (Exod. 29:13) is repeated monotonously in the instructions given for the sacrificial offering of bulls, rams, sheep, and calves and restated all over again as Moses installs Aaron as high priest, who then makes the prescribed sacrificial offerings: “And he took the fat, and the rump and all that was upon the inwards and the caul above the liver, and the two kidneys, and their fat, and the right shoulder” (Lev. 8:16). This may be a custom acquired from the Egyptians. The kidneys and their surrounding fat as funerary offering is documented in a relief (ca. 2700 to 2200 BCE) from the tomb of Tepemānkh (Figure 2). There is a reference to the kidneys as nourishment when in the recounting of God’s loving actions on behalf of Israel, Moses recalls how the Lord found Jacob abandoned and fed him “butter of kin, and milk of sheep, with fat of lambs, and rams of the breed of Bashan, and goats, with the fat of kidneys of wheat; and thou didst drink the pure blood of the grape” (Deut. 32:14). Relief from the tomb of Tepemānkh (Djadjaemankh), ca. 2700 to 2200 BCE. Louvre Museum, Paris, France. Reproduced with permission. 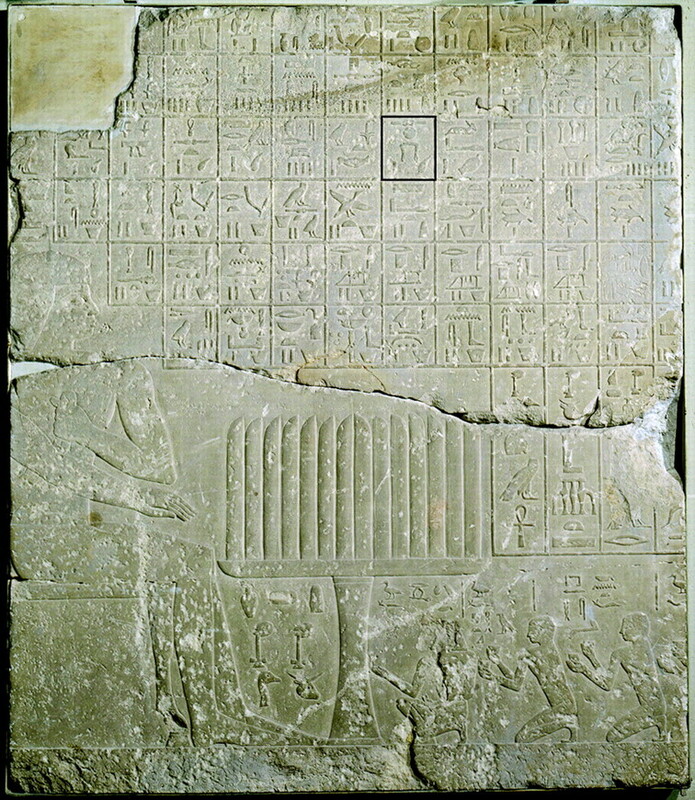 Among the list of funerary offerings, fat around the kidneys is shown in the boxed hieroglyph. Because only the best of everything must be offered to God, it is not unexpected that the kidneys and their surrounding fat would be part of the sacrificial offerings, and because it was believed that the Hebrew God did not eat like the statues of human and animal gods of Egypt and Mesopotamia, the offerings were not placed but burned at the altar so that smoke from the burned food would ascend skyward, where the spirit of Yahweh roamed. The blades used for sacrificial slaughtering seem to have been considered blessed and used by God in the slaughter of the enemies of Israel: “The sword of the Lord is filled with blood, it is made fat with fatness and with blood of lambs and goats, with the fat of the kidneys of rams; for the Lord has a sacrifice in Bozrah, and a great slaughter in the land of Idomea” (Isa. 34:6). The Temple and its rituals had a distinct role in the delivery of health care (34). Those who contributed to the Tabernacle were promised protection from plagues to come (Exod. 30: 12). According to Josephus, sacrificial offerings were made for the expulsion of disease (35). That sacrificial offerings, which entailed the burning of kidneys and their surrounding fat, were used for medical problems is illustrated in Figure 3, showing Joachim burning his offerings at the altar. It seems to have been favorably received as his wife Ann, who had been barren theretofore, gave birth to Mary thereafter. This story from one of the Apocryphal Gospels (Pseudo-Matthew 3:1 to 3) is reminiscent of the birth of Samuel, the first king of Israel (1025 to 1005 BCE), following the petition for fertility of his childless mother Hannah at the shrine of Shiloh (1 Sam. 1). Joachim making a sacrificial offering at the altar, 1304 to 1306. Fresco by Giotto (ca. 1276 to 1337). Scrovigni Chapel (Arena Chapel), Padua, Italy. Reproduced with permission. Note in the foreground all of the sacrificial offering of animals of which the kidneys and their surrounding fat are individually cited in the books of Exodus and Leviticus. Burning on the altar are the remains of an entire kid, while the angel on the right announces the favorable reception of the offering and that Joachim’s wife Ann, who had been barren theretofore, would give birth to Mary in due time. Allusion has been made that the burning of the inwards of sacrificial animals was for economic reasons because they were not considered edible. This certainly is not applicable to the kidneys themselves that seem to have been consumed and those from a 3-yr-old calf considered a special delicacy (36). Besides, more than just the inwards were used in offerings as the above quote about Aaron indicates, and at times, the whole animal was burned (Figure 3). The use of the kidneys in sacrificial offerings may be related also to their broader allegorical importance discussed in the section that follows. To differentiate between anatomic references to animal kidneys as body parts burned on the altar in the Torah from its subsequent figurative use in later books authored by more poetic biblical scribes, the translators of the King James Bible elected to use the term “reins” rather than kidneys in referring to the latter instances, perhaps reflecting their stated commitment to enrich the language with “civility and eloquence” (37). The scriptures, much like the ancient literature of the Middle East, make figurative use of several internal organs as symbols of wisdom, emotions, and vigor (1,38). The ancients did not have a detailed psychologic vocabulary to make the fine linguistic distinctions introduced in modern speech. The figurative use of organs, with their multilayered metaphoric implications, circumvented these limitations. It was their means to bring the imagery of our recently acquired psychologic terms into a series of manageable and easily visualized linguistic expressions to discern the meaning of human experiences. As a book used to teach the law and ethics to illiterate farmers and shepherds, this was a powerful tool, much like that of the imagery of the stained windows of cathedrals in the Late Middle Ages. The most commonly used organ for these purposes was the heart, as a symbol of intellect and wisdom, and blood, as a symbol of the life principle (18). Unlike most ancient literature, however, the kidneys receive special attention in the Bible as the seat of conscience, emotions, desire, and wisdom. The broader region of the loins, which according to the Oxford English Dictionary is implied in the now archaic term “reins,” is considered the site of physical strength and prowess (Job 40:7; 2 Sam. 20:8). However, unlike the kidneys, reference to the heart as an anatomic organ is extremely rare in the Bible (1 Sam. 25:37). Conversely, the liver, which is cited repeatedly as an anatomic organ alongside the kidneys in animal sacrificial offerings, is used only once figuratively in the Bible as the site of intense grief (Lam. 2:11). The kidneys are mentioned five times in the Bible as the organs examined by God to pass judgment on a person. They are mentioned either before or after but always in parallel with the heart, as for example, “I the Lord search the heart, I try the reins, even to give every man according to his ways, and according to the fruit of his doings” (Jer. 17:10), and, “Examine me, O Lord, and prove me; try my reins and my heart” (Psalms 26:2). All five mentions are in Jeremiah and Psalms, both of which are poetic and epigrammatic in style and, hence, their free metaphoric use of the kidneys and heart as the central essence of a person, or, as we would call it now, the psyche of a person. This metaphoric use of the heart and kidneys does not seem to be due to transference from a specific anatomic meaning but to the survival of a more vague, more general, and earlier meaning of the deeper “inwards” of a person, a term also used in conjunction with the sacrificial use of the kidneys mentioned above. Both the kidneys and the heart were internal organs, well hidden from view but accessible to the look of God. This use of the heart and kidneys in parallel seems to have its roots in Egypt and Mesopotamia. Whereas the heart was the organ examined by the gods in Egypt, the kidneys are mentioned alongside the heart in the Egyptian Book of the Dead: “Homage to thee, O my heart! Homage to you, O my kidneys!” but then only once (39). Attribution to Egyptian customs has been made on the ground that the heart and kidneys were left in place during mummification. This seems to have been the practice during the early days of mummification, but there is evidence that later on, the kidneys or at least fragments of them were removed, mummified, and placed back in the abdominal cavity or stored in canopic jars alongside the other viscera (40). During their stay in Egypt, the Hebrews were exposed to these procedures. Actually, the first use of the word “physician” in the Bible is when Joseph is said to have employed “physicians to embalm his father” (Gen. 50:2) and had himself embalmed by them later on (Gen. 50:20). Temperaments were also associated with organs in Mesopotamia, where the liver assumes the leading role with occasional mention of the kidneys and the heart cited in parallel with the liver as sites of emotions. In some instances, the kidneys replace the liver and were used in parallel to the heart (1). The kidneys are mentioned four additional times in the Bible, sometimes in direct connection with the heart, as the site of emotions and intellect. Some of the attributes principally assigned to one of these two organs are at times credited to the other. Thus, whereas the heart is the organ considered to be the site of wisdom and the governing center of rational processes, it is a function that is attributed also to the kidneys, as in, “I will bless the Lord, who has given me counsel; my reins also instruct me in the night seasons” (Psalms 16:7). The Midrash on Genesis (Genesis Rabbah 61:1) tells that the illiterate Abraham was taught the law by his kidneys and then developed the recognition of God from within himself (13,38). Conversely, whereas the kidneys are considered the site of affections, as in the verses of joy, “Yea my reins shall rejoice, when thy lips speak right things” (Prov. 23:16), and of faithfulness, “And righteousness shall be the girdle of his loins, and faithfulness the girdle of his reins” (Isa. 11:5), they seem to share their position as the site of affections with the heart as in the following verse of grief: “Thus my heart was grieved, and I was pricked in my reins” (Psalms 73:21). No other internal organs of the body are mentioned in parallel in the Bible as often as are the heart and the kidneys. Divine injury to the kidneys is mentioned three times in the Bible. Job, lamenting his calamities (Figure 4), comments that “His archers compass me round about, he cleaves my reins asunder and doth not spare” (Job 16:13), and again, “Whom I shall see for myself, and mine eyes shall behold, and not another; although my reins be consumed within me” (Job 19:27), as does Jeremiah: “He hath caused arrows of his quiver to enter into my reins” (Lam. 3:13). The Complaint of Job, ca. 1786 by William Blake (1757 to 1827). Reproduced with permission from the Museum of Fine Arts of San Francisco. Among Job’s complaints cited in the Bible are that the “physicians of no value” (Job 13:4) of the time could not provide relief when his “reins were consumed within me” (Job 19:27). The Kidneys in the Bible: Where Do They Stand? As a result of advances in medicine, psychology, and linguistic terminology, the biblical metaphoric attributes of the kidneys are now associated with the brain and the mind. Indeed, in recent versions of the Bible, the term “mind” is substituted often where the authors of the original text used the kidneys, yet the brain is not mentioned in the original scriptures. It seems that the Hebrews, like the Egyptians, who discarded the brain during mummification, did not consider the brain an important organ (40,41). Although this may be considered a speculative assumption, the Hebrews during their centuries of residence in Egypt were familiar with the embalming customs of their hosts, and, as mentioned above, it was used at least by some of them, such as Joseph and his father. Whereas it would be wrong to project our modern concepts and use of language on that of the archaic biblical story tellers, there might well be more consciousness of a physical basis in their metaphoric use of the kidney than there is in our continued use of the metaphoric heart as we still speak of something being “the heart of the matter” or sing “I left my heart in San Francisco.” Why then of the three principal organs used metaphorically in the Bible the heart continues to be used to the present, whereas that of the liver has been lost except for its residual in “melancholy” and that of the kidneys has disappeared without a trace? The answer lies in the gradual increase of Hellenistic influences on Western culture since the closing centuries of the first millennium BCE (Figure 1). In his account of the creation of man in Timaeus, Plato (428 to 347 BCE) made the head the most divine and sacred part of the body, where it is placed at the very top and separated by the neck from the trunk, which in its upper part contains the mortal soul and is distinctly separated from the baser part of the trunk, which houses the appetitive organs (42). Plato made no mention of the kidneys in Timaeus. In essence then, the head, in its near-perfect geometric figure of a sphere, houses the brain and mind, now considered as the site of wisdom and essence of humans. There is no more need for God to look at the “inwards” of the Egyptians, Mesopotamians, and Hebrews of old; a mere glance at the mind and soul located in the head would suffice. The ancient “inwards” and mysterious kidneys were now relegated to mere supportive nutritive functions and accordingly placed in the lowest part of the body, where they are well separated from the rest of it by a strong diaphragm (42,43). Parallel advances in medicine provided functional evidence for this philosophical interpretation of the body, with its strong religious overtones. Neither the Egyptians nor the Mesopotamians considered the kidneys an excretory organ. Urine was thought to be formed in the bladder (44). Hence, the otherwise functionless and well-hidden kidneys were given a spiritual role of vigor, strength, emotions, and wisdom. Whereas it was Galen (131 to 200 CE) who provided conclusive experimental evidence that urine was formed in the kidneys (44), the kidneys as the source of urine long had been considered by his predecessors, after anatomic dissections revealed their connection to the bladder by the ureters. Indeed, the first medical text on diseases of the kidneys and bladder by Rufus of Ephesus (ca. first century CE) was published a century before Galen (Figure 1), at just about the time that the Gospels were being composed (45). As such, the kidneys as mere generators of waste products could now be debased or even neglected, as did Plato, because of their location in the abdomen alongside the nutritive organs. Despite the absence of mention of the kidneys in the later books of the Bible, the Hebrew use of the kidneys as the site of prudence, craftiness, and shrewdness persisted and permeated the biblical teachings of the Christian era as in the explanation of the Syrian Father (later saint) Ephraem (ca. 306 to 373 CE) that: “In the kidneys are seated reasonings, and there dwells in them the faculty of discernment; they distinguish truth from falsehood, and judge what is base and what is noble” (38). This may account for the single mention of the kidneys in the New Testament: “And I will kill her children with death; and all of the churches shall know that I am He which searches the reins and the hearts: and I will give unto every one of you according to your works” (Rev. 2:23). To differentiate these noble allegorical functions of the kidneys from their mundane physiologic function as excretory organs, the translators of the Bible into English, first John Wycliffe (1330 to 1384) and his associates, elected to use “reenes” instead of “kidneris” in the 14th century, and subsequently the divines, who at the request of King James translated the Bible in the first decade of the 17th century, decided to use the reins rather than the kidneys (37,46). By the time that these translations into the vernacular were published, the function of the kidneys as filters of waste products was well recognized. Nevertheless, the figurative use of the reins and kidneys seems to have continued well into the 19th century as in, “They are girdled about the reins with a curse,” in an 1865 poem by A.C. Swinburne (1837 to 1901), a Victorian man of letters, and in an 1880 comment by his contemporary Disraeli (1804 to 1881): “It was a large and rather miscellaneous party, but all of the right kidney” (46). The death blow, that was to prove Plato prescient, came in the late 1960s, when improvements in resuscitation techniques and increasing feasibility of organ transplantation provided a new stimulus to “salvage the kidneys,” necessitating a new definition of death as irreversible brain function (brain death) rather than the traditional cessation of respiratory and cardiac function (47). From the perspective of nephrology, it is unfortunate that the biblical metaphoric use of the kidneys, which seems to have survived Greek analytical philosophy and rational medicine during the first centuries of the Common Era, was weakened after the Scientific Revolution, when the sensory-motor functions of the brain were elucidated and ultimately lost because of the very success of nephrology in making kidney transplants possible. It is not unexpected then that in recent translations of the Bible, the “mind” and “soul” are substituted for the original “reins” not only by Christians but also by Jews as in the most recent Tanakh Translation of the Torah, Nevi’im and Ketuvim (48). It will be unfortunate if future generations are not able to appreciate the nuances and multilayered overtones of the reins that the biblical authors intended and may have been one reason for their use as sacrificial offerings to the Lord. I thank Eberhard Ritz for the initial idea for this paper and William G. Couser for inviting me to write this article, whose preparation exposed me to vistas I had not fully appreciated before, and Markham J. Geller for reading and commenting on an early draft of the manuscript. Editor’s Note: With delivery of the December issue of JASN we complete Volume 16 of the Journal and thereby its 16th year of publication. Although invisible in the pages of JASN Volume 16, this year and volume span a period that has been a particularly turbulent one around the world and for nephrologists and their patients in many areas. The tsunami in Thailand in late 2004 was felt deeply in 2005, as were hurricanes Katrina and Rita in the US, the terrorist bombings in London, the continuing war in Iraq, and the earthquakes in Pakistan and India—all events that challenged both the provision of optimal patient care in affected areas and, by consuming scarce resources, the advancement of renal science everywhere. As we enter this 2005 holiday season for Christians and Jews, it is comforting to step back from the travails and natural disasters of our time over which we seem to have so little control and to take a broader and more historic view of our discipline. In the following article, Dr Gary Eknoyan provides a unique perspective on kidneys and their role in human life and history as seen by the ancients and described in the Bible, that ancient text that inspires so many of our current holiday traditions and celebrations. As one reads the story one is struck by the important role played by our organs of interest in nephrology, early exceeding the brain and the heart in stature as the seat of “conscience, emotion, desire, and wisdom” in the ancient texts. The cover illustration depicts Joachim employing sacrificial offerings that entailed the burning of kidneys and their surrounding fat to enhance the fertility of his previously barren wife who later gave birth to Mary. The story and the picture both convey a remarkable sense of the distance we have traveled in renal medicine since ancient times and tie the kidneys to a message of hope that we need to hear at this time of year and at this point in history. Enjoy the paper, and happy holidays from the JASN editorial staff. You are going to email the following The Kidneys in the Bible: What Happened?